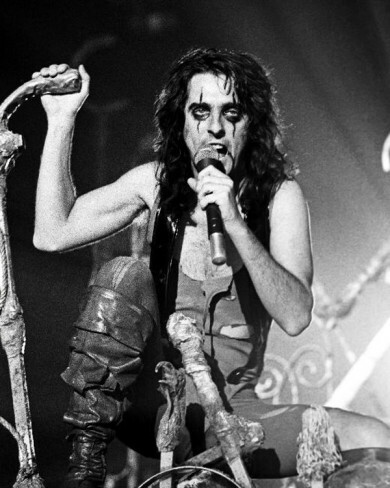 Part Psycho Circus, part Jerry Springer show, part Quentin Tarantino shock-fest, Alice Cooper’s Welcome to my Nightmare album and subsequent tour was, depending on your point of view, either ridiculous or brilliant. The ultimate answer is of course given the benefit of historical perspective, that the album is ridiculously brilliant. 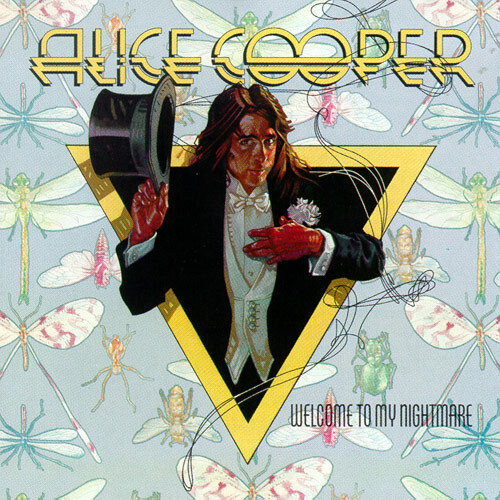 Released in 1975, the album was Alice Cooper’s first post band break-up outing and is by far the best solo record of his decades long career. Giving up the comfort of a consistent touring band and going to ax person by committee was certain to be a calculated risk. It was going to be hard to improve on Billion Dollar Babies, his previous album that included the hit songs “Elected,” and “No More Mr. Nice Guy,” and was the bands biggest seller to date, and the future of the entire enterprise without guitar muse and songwriting partner Glen Buxton was anything but certain. The new direction was going to turn the theatrical knobs up to 11, and incorporated many of the shock and awe elements from prior albums along with songs that were a bit more visceral in nature dealing with psychological horrors of the mind right alongside the physical ones. The album was a top 10 seller, largely on the strength of the songs “Department of Youth,” “Welcome to My Nightmare,” and the somewhat controversial for the time “Only Women Bleed,” a song that reached the top ten, and was protested by various women’s groups due to the subject matter that dealt with spousal abuse. The song was also somewhat of a departure for Cooper in that no song he had previously recorded was as political or thought provoking. The fact that it was also a ballad, also served to put the Alice Cooper coven of fans on notice that a change was coming, and they were not necessarily going to like what the future had in store. A concept album centered around the nightmares of the main character Steven, Welcome to My Nightmare, much like a Broadway play, was expressly written for the stage, and a tour was launched shortly after the release date where the record was performed mostly in its entirety. With production duties handled by long-time collaborator and Cooper Muse Bob Ezrin, the record has the feel of a real concept album in the Tommy mold, and is best digested in one sitting. The mix of rockers like the standout “Department of Youth,” and the guitar heavy anthem “Devils Food,” are intrinsically interspersed with the somewhat creepy “Steven,” a song that seems to share some DNA with the theme from exorcist, with the far off calling of Steven’s mother downright chilling, and the equally scary “The Awakening,” all kicked off in fine macabre fashion with “Welcome to my Nightmare,” a song that goes from a whisper to a scream to set the stage for what we are about to experience. Welcome to my nightmare I think you’re gonna like it. I think you’re gonna feel you belong. To say that Welcome to My Nightmare marked the end of Alice Cooper’s commercial appeal may be stretching things a bit. After all, his live shows are still immensely popular; he has his own radio show, and has recently been elected to The Rock and Roll Hall of Fame. But in reality, the album did mark the creative zenith of his career with subsequent albums Lace and Whiskey, Zipper Catches Skin, Dada, and Hey Stoopid, never even coming close to the artistic marvel that was Welcome to My Nightmare. Much like anchovies on a pizza, an Alice Cooper show is something everyone should experience at least once. On recent tours, he has assembled a top notch band that includes Orianthi, the Aussie guitar goddess that was scheduled to play “Beat It” on the ill-fated Michael Jackson comeback tour that never was, and he has not lost a bit of his energy, strutting around the stage and striking poses that would make Mick Jagger jealous. As a rock icon, Alice Cooper is one of the best. Welcome to My Nightmare is not Blood on the Tracks, and it certainly is no Tommy or Quadrophenia. It is what it is, a glorious shock jock guilty pleasure sort of a listen, one that should be consumed with gusto every Halloween. So turn out the lights, lock the door, place the candy on the porch on a self-serve chair, and put the record on the stereo, at maximum volume of course. The candy may not last past the second set of kids, but your retro time warp back to 1975 will make you a better person, sooth your soul, and your ears will thank you. Give the album a listen! Check out a full concert from Alice. It’s recent and shows he’s still rockin’ to the rules that he makes.